The STEMD² learning platform provides student courses to help improve student’s mathematical thinking, 21st-century learning skills, and leadership using socially and culturally relevant learning activities in real-world settings. Students can use the STEMD² platform to network and collaborate with other students, share ideas and solutions, and experience problem-solving across socially relevant subjects to complete interdisciplinary projects. STEMD² Teacher Professional Development Program provide training in inclusive strategies that help educators prepare for, implement, and discuss socially and culturally responsive problem-based learning. Through our PD courses, teachers build skills and access resources that make problem-solving the focus of each activity. Teachers use social networking technologies to help students develop deep mathematics knowledge. STEMD² Research & Development Group explores, experiments and executes research-based practices to support STEM education transformation, particularly the education of marginalized learners and students with special learning needs. Our ultimate goal is to close the achievement gap and pave the way for underrepresented learners in STEM programs. The lab’s unique location in Hawaiʻi allows us to innovate and test socially and culturally responsive strategies among diverse students such as technology-enabled social learning through human connection. 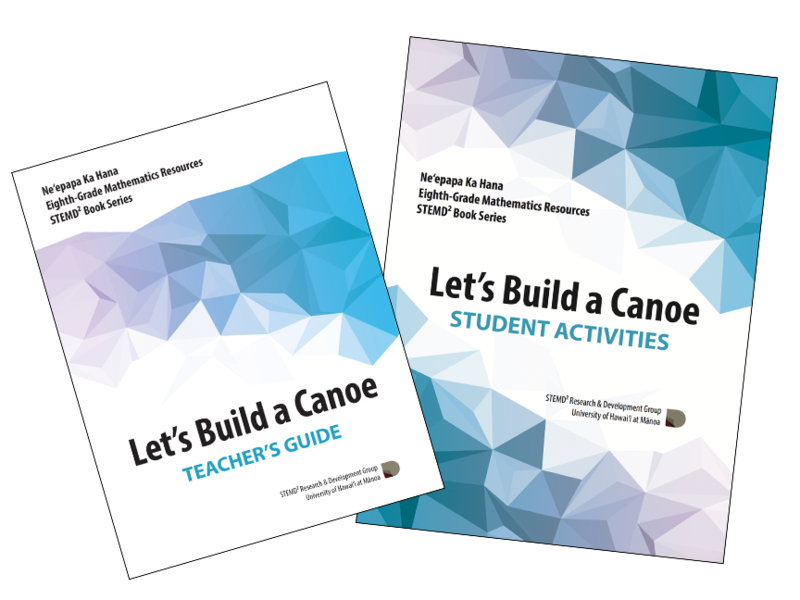 STEMD² Research & Development Group publishes Book Series as part of Ne’epapa Ka Hana model for teaching mathematics in Hawai’i middle schools. This book series seeks to provide Hawai’i middle school teachers resources and training to incorporate problem-based learning, social learning, and inclusive pedagogy through a culturally relevant mathematics curriculum. The series currently includes: • Let’s Build a Canoe – Student Activities and Teacher’s Guide (Common Core aligned) • Let’s Play the Ukulele – Student Activities and Teacher’s Guide (Common Core aligned) • Let’s Go Fishing – Student Activities and Teacher’s Guide (SBAC aligned) • Let’s Make Da Kine – Student Mini Projects and Teacher’s Guide (Skill development) The printed and online resources produced by NKH through STEMD² are fully aligned with the Common Core Standards for Mathematical Practice and Content and the Smarter Balanced Assessments for mathematics. Based on the GO Math! curriculum structure, the NKH STEMD² book series and social learning platform (www.stemd2.com) is flexible for teachers to implement partially or fully in their classrooms, as a tool to encourage students’ interest and achievement in STEM subjects.